The current economic climate and need for expanded access and completion for all students, especially underserved populations, in higher education have sparked renewed interest in outcomes-based funding (OBF) policies, which tie a portion of state funding to institutional performance metrics. Today 30 states are developing or implementing OBF policies. 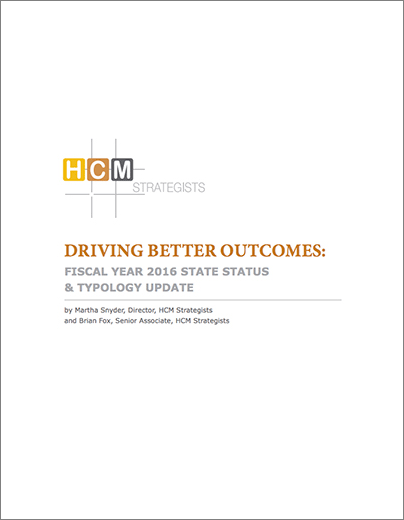 HCM Strategists’ Martha Snyder and her team update the 2015 report Driving Better Outcomes: Typology and Principles to Inform Outcomes-Based Funding Models for 2016 with enhanced analysis of state OBF policies. Driving Better Outcomes: Fiscal Year 2016 State Status & Typology Update, provides data on the continued development of OBF policies throughout the nation. The report, funded by the Bill & Melinda Gates Foundation, also evaluates OBF policies based on key elements they address and the level of funding they command. The aim of this classification effort is to help inform policymakers, stakeholders and researchers by developing, improving and analyzing postsecondary funding policies that incent and yield the best outcomes for students. The 2016 update provides additional in-depth analysis of funding model components for all states with OBF policies in place for both the two-year and four-year sectors. The combined funding available to institutions through tuition and direct state aid are examined for five states with relatively advanced OBF systems. This analysis allows state policy makers, institutional leaders and researchers to have a better understanding of the full picture of funding flowing in to support students and education in states with OBF policies in place. Although many states have embraced some aspect of OBF policies, only a few states have developed and implemented fully aligned state finance policies with objectives to increase student attainment and close student equity gaps, and several have not considered these policies as an option. Policymakers, institutional leaders and other stakeholders must continue to evaluate and understand how these finance policies, in their varied design, align with objectives to support students to complete their programs of study successfully.